For new riders, the costs of motorcycle insurance can be a surprise. Younger riders in particular may find that their annual motorcycle insurance premium may cost as much as their motorcycle did. Finding out what insurance is before you buy is important because young or old, the first year riding will be your most expensive year riding. Don’t jump the gun and start riding before you can afford it, or you’ll be tempted to go cheap on insurance, gear, and a safe reliable machine. Making any of those mistakes can cost you in the long run. The amount of coverage you choose to get. 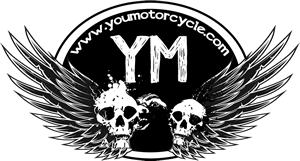 Where to get motorcycle insurance from. What to do? Get quotes for different displacement sizes and classes of motorcyles. This way, when shopping around, you’ll have a better of idea of how each bike fits into your budget. Sample motorcycles to request quotes for: 2008 Kawasaki Ninja 250, 2005 Kawasaki Vulcan 500, 2004 Honda Shadow 750, 2004 Honda CBR-600. The CBR isn’t beginner-friendly, but you’re the type who has wet dreams over crotch-rockets it’ll give you the reality check on the high rates of insurance of these kinds of bikes. 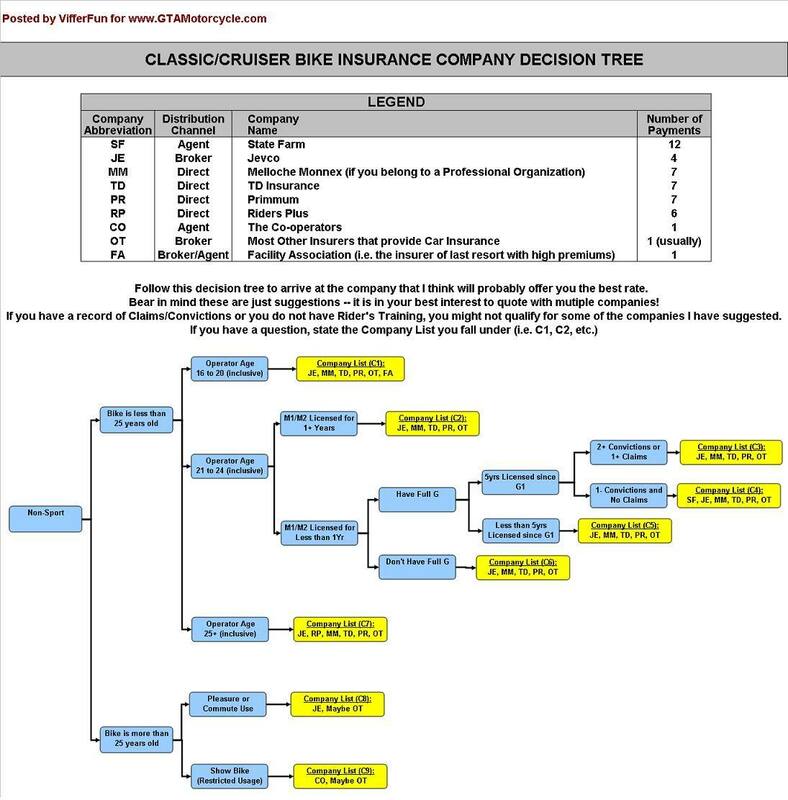 b) A rough idea of how much different sizes and types of motorcycles would cost you to insure. How to contact motorcycle insurance companies and brokers? Boundless @GTAMotorycle created a list of motorcycle-friendly insurance companies and brokers years ago. The list contains website, phone number and even fax information to help you get your quotes. 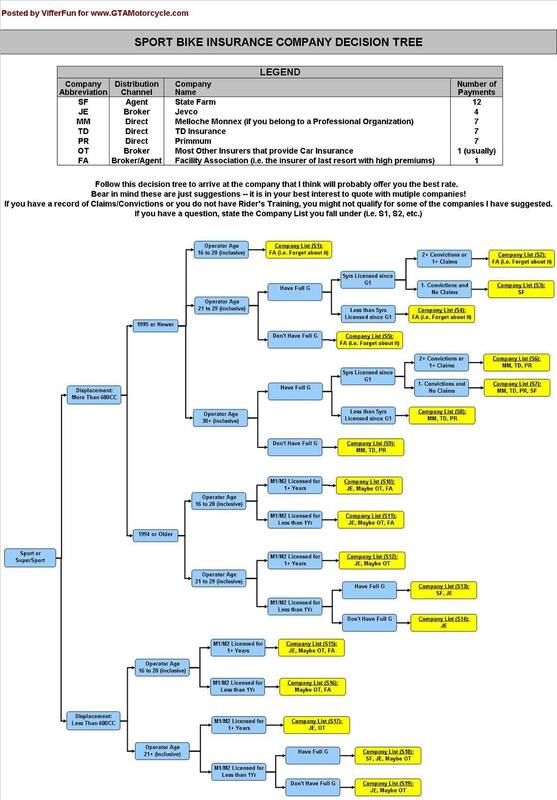 We’ve put it into a Printer-Friendly PDF Document available here: List of Motorcycle Friendly Insurance Companies and Brokers. Step 1 was lengthy but necessary. We apologize for profusely, but don’t worry Step 2 – How to get your motorcycle license will be much shorter, and will include ALL of the questions your test will ask you. Check it out or go back to our Guide to Buying Your First Motorcycle.